Who isn’t in love with Xu Kai nowadays? Thank heavens!!! A kind soul is translating the ending of the novel The Journey of Flower. One more thing, Peanuts told me about a site with a lot of translated Chinese novels. The TV station airing Heavy Sweetness, Ash-like Frost calls the drama Ashes of Love. I love the title they use so I’m going to go with that, too. 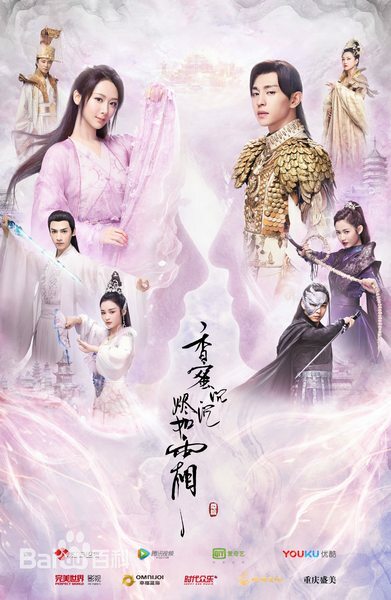 I’ll be working on Ashes of Love at https://www.dorayakiz.com. I want to separate my work into two blogs. This one is only for translating Chinese novels. My other one will be just for dramas. Ashes of Love/HSALF is subbed at JiangsuTV’s Youtube Channel. Heavy Sweetness, Ash-Like Frost Airing on August 2nd!!! I’m SO excited!!! Heavy Sweetness, Ash-Like Frost will air on August 2nd!!! Despite reading way too many Chinese romance novels for my own good, this remains my favorite fantasy romance story! And I have full confidence Deng Lun will do an amazing job as my beloved Phoenix. I can’t think of a young actor with the acting chops who fits the role more than Deng Lun. The newly released MV for the ending song looks amazing!! I love the CGI for Phoenix’s feather which he gave to Jin Mi to protect her. See it at 2:08-2:10!! It looks more gorgeous than what I imagined when I read the novel. I want one, lol. A glimpse of the new epilogue at 2:27-2:30. And of course THE WEDDING at 2:01-2:06!!! Oh my gosh, THE WEDDING!!! I haven’t seen it, but I’m ready to cry already, lol. I’m hopelessly obsessed!! Been watching this over and over. I don’t think I can sleep at night unless I watch this MV at least 50 times a day until the drama airs, lol. Fuyao drama with Eng subs at Youtube & Viki. English translation of the novel Legend of Fuyao. I am madly, deeply, hopelessly in love……with the Crown Prince of Tianquan Kingdom, lol. Wuji slaying my heart with his smile, lol. My favorite OTP in drama land this year: Wuji & Fuyao!!! Dian Xian, the author of the novel Heavy Sweetness, Ash-Like Frost, wrote a new epilogue for the drama adaptation. You can read the completed Eng translation of the novel at decembi’s blog. There’s a Park Bo Gum fever going around. Since I’ve no immunity against handsome faces, I’m infected as well, lol. PBG’s drama Moonlight Drawn By Clouds is based on a Korean novel. I’ve been googling nonstop hoping to find a translation of the novel. Hey, hard work does pay off because look what I found!!!! I read that the Viet version is based off of a Chinese machine translation of the Korean novel. This means some stuff will probably be lost in translation, but beggars can’t be choosy, lol. If you know Chinese, you can search for the Chinese version online. Good luck!!! As of right now, I’m not aware of a translation in English or any other languages except Chinese and Viet. Of course anyone who can buy the original novel in Korean should do so to support the author. Unfortunately, there are many fans who live overseas and don’t know Korean :(. This is a summary, not a full translation. I can’t translate the entire epilogue because it is too long and complicated, but I did translate 2 sections. Summary is italicized, direct translation is in regular font. Qing Shui pulled at Luo Shi Yi: “How is it? Still not allowing people to see her! What should we do? She’s heavily injured!” She began to cry. Please do not post my translations anywhere else.